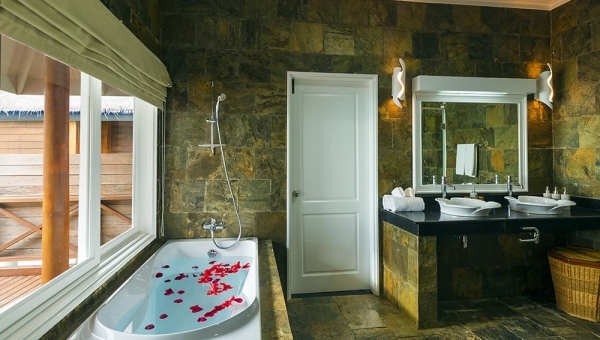 Stay relaxed as you indulge in the ultimate luxury at Sun Aqua Vilu Reef. 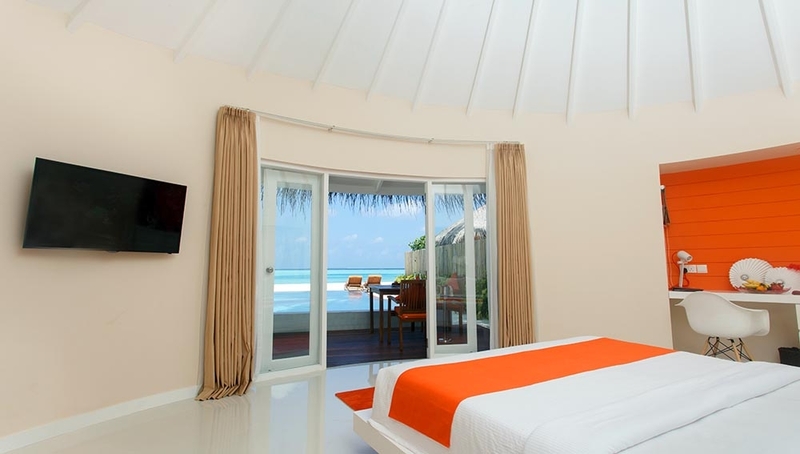 The 5 star beach resort will bring you so much closer to the unparalleled beauty of the Maldives. 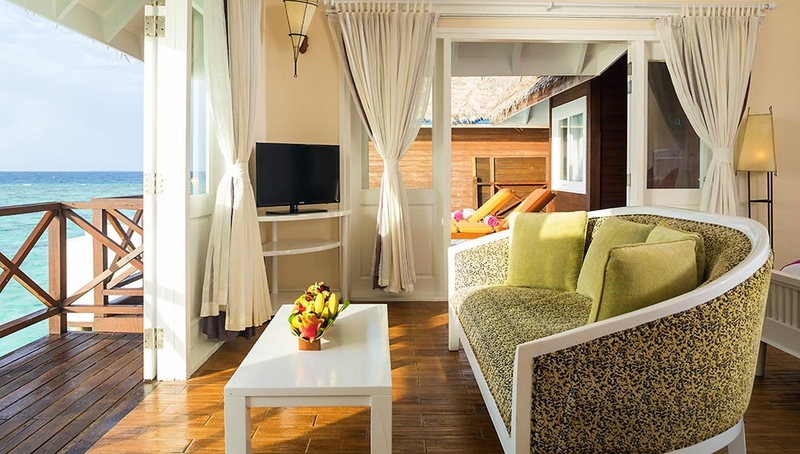 Immerse yourself in the paradise island as you stay in one of the luxury villas - whether you're overlooking your own private pool, the lagoons, the beach, or the ocean you are guaranteed to wake up to beautiful views every day. At Sun Aqua Vilu Reef they believe that holidays are made for relaxing, so why not take some time to enjoy a spa treatment or two at the Sun Spa? Indulge in VIP treatment in the rooms and spoil yourselves with a romantic dinner for two on the beach. 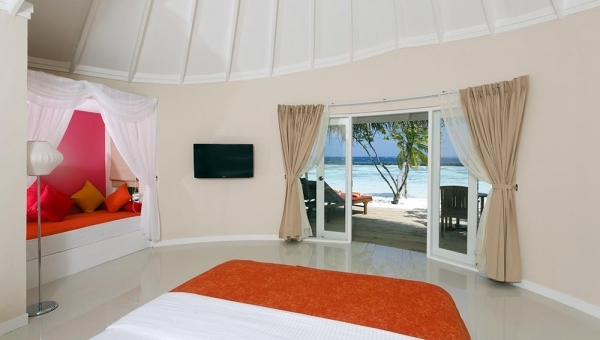 Whatever you choose to do on your luxury holiday in the Maldives, make the most of it at Sun Aqua Vilu Reef. 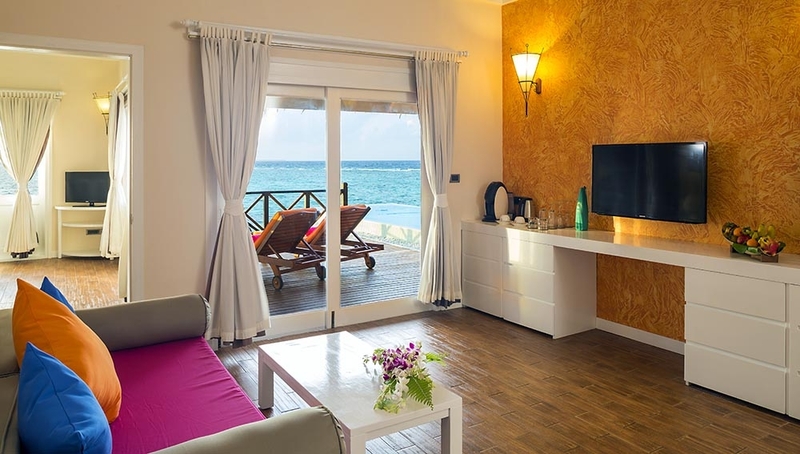 The Sun Aqua Vilu Reef Resort is located on Meedhuffushi Island in South Nilandhe Atoll, 128km south of Maleâ€™ International Airport. 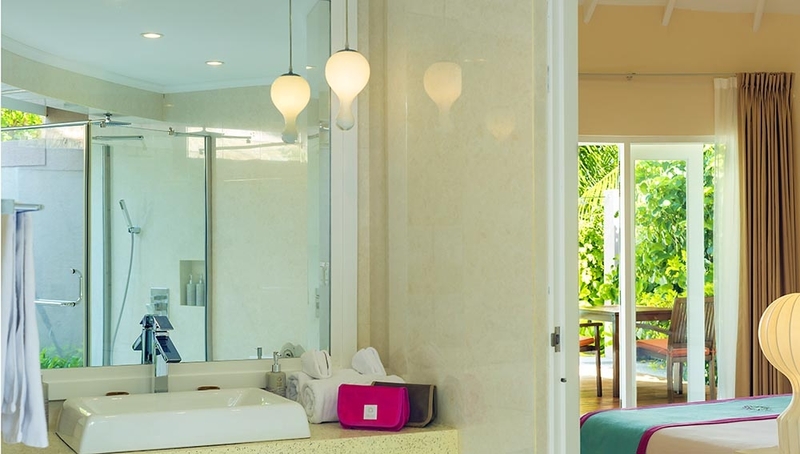 The villas of Sun Aqua Vilu Reef give you a bite of island life â€“ a laid back luxury that brims with warmth. 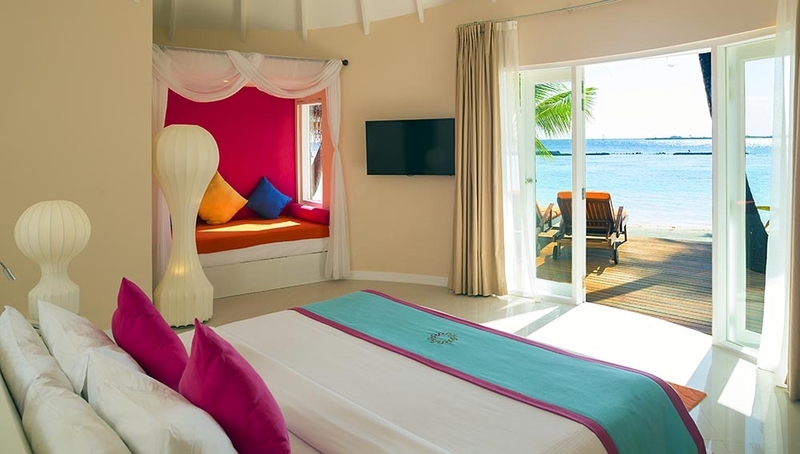 If you prefer a beach scene, there are five villa categories dotted along the sandy shoreline â€“ all freshly refurbished in bright island hues. 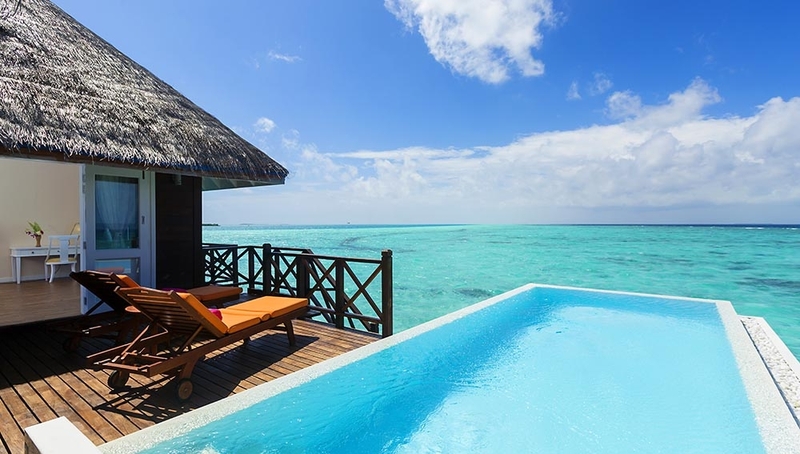 Or, if youâ€™d like to stay over the lagoon, they have a loop of spacious overwater villas, each with far-reaching panoramas of the Maldivian sea. 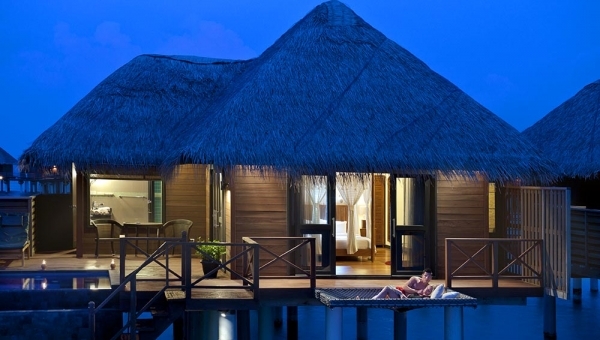 Drift off to sleep to the sound of the waves and dive into the water from your own private jetty. With 103 exquisite Luxury Villas, 6 Suites, 62 Land Villas, and 35 Over Water Villas, they really do have something for everyone. Follow up a day on the water with a night on the dance floor. Evenings come to life at Sun Aqua Vilu Reef with live music, DJs, cultural songs and dances, and open-air bars moving to the beat of bodu beru drums. Enjoy a film under the stars at movie night on the beach or join a lively night of karaoke and sing to your heartâ€™s content. You can stay fit in our fitness centre, or take a private yoga class in the gardens to reconnect with nature. Thereâ€™s badminton, tennis, billiards and board games to exercise your competitive spirit, and a divine infinity pool for those with a mind to idle the day away. Please see below for information on the activities and facilities available during the day at Sun Aqua Vilu Reef. 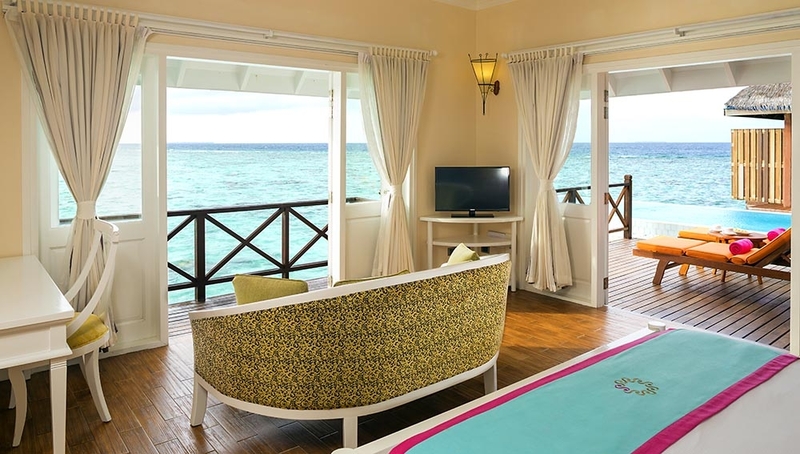 Explore an enchanting under water world from the shores of Sun Aqua Vilu Reef. Whether you are an expert or a beginner the dive school has classes and diving experiences guaranteed to impress. The PADI Gold Palm and DDI Diamond certified Sun Diving School conducts courses for beginners and children so you can enjoy the best diving spots in the Maldives as a family. Explore underwater caves, discover coral covered wrecks or simply drift along and experience life under the surface. For less confident divers, the house reef is full of life and just 30 meters from the shoreline. Adventure calls, so explore beyond the shores of the resort on an island expedition. There are sailing trips, sunset cruises aboard our catamaran, cultural visits to nearby fishing villages, and jaunts across the ocean in a traditional wooden dhoni. Pack a picnic lunch and sneak away to a secret island, or embark on a dolphin spotting tour â€“ the possibilities stretch as far as the horizon. The irresistible waters of the Maldives offer something for everyone. You can explore the lagoon by canoe or glide across the tides on a windsurf board. There are doughnut rings and banana-boat rides for the adrenalin seekers and lessons with experts for those who want to take a new skill home. 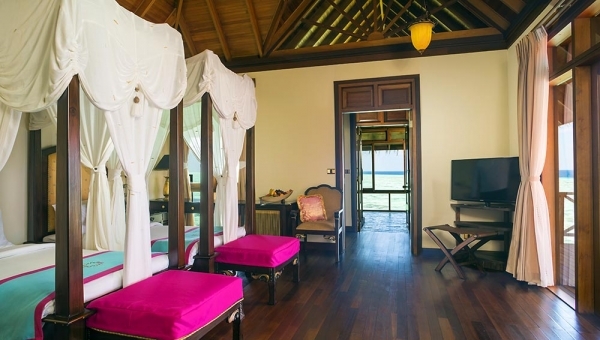 Sun Aqua Vilu Reef is a luxury family friendly resort island in the heart of the Maldives. They have activities available for guests of all ages and even a babysitting service for any parents who want a bit of time alone. The kids' club encourages your children to make friends, join fun activities and get to know fellow junior travellers from around the world. Organic home grown produce plus some of the world's finest ingredients equals an exciting fusion for world cuisine. Vilu Reef farms their own vegetables on a dedicated agricultural island and source fresh seafood daily to ensure the best ingredients for all of the restaurants. Explore the tastes of Thailand, Italy, India, and beyond, all washed down with a selection of fine wines. 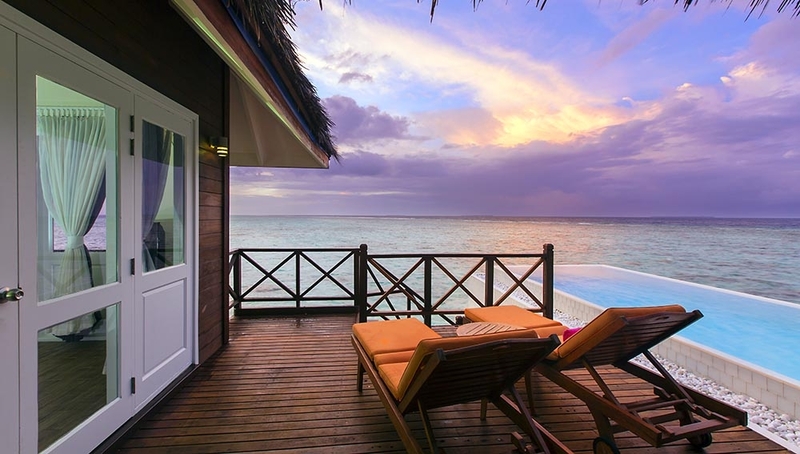 Scroll down to discover the 4 dining options, 2 bars and Wine Cellar at Sun Aqua Vilu Reef. Whether you want to enjoy a quiet lunch on the beach, a family dinner on your private terrace or a romantic dinner over the water just let the team know and they will bring the finest dishes to you. Your holiday in the Maldives is your chance to relax in pure luxury so while you're here you can eat whatever you want from the menus, wherever you want it. Melted mozzarella, sweet island pineapple, rich red tomatoes grown in the resort's garden â€“ the new pizza joint is destined to impress. Hand-stretched pizza bases are topped with the freshest ingredients, with authentic seasonings and sauces for the heartiest of meals. Craving some exquisite wine perfectly paired with each selected dish? Looking to taste speciality wines and discuss their taste profiles with an expert? Wine can transport one to faraway places with its aromas and flavours. Taste some of the worldâ€™s vintage treasures. As you swirl and sip by candlelight, and enjoy gourgÃ¨re puff pastries, charcuterie, and cheese, the Sommelier will share his insider knowledge of the different wines. Sweet tropical shakes, ice cold mocktails, vitamin-packed smoothies â€“ at the pool bar you can replenish body and mind against a beautiful backdrop of the Maldives. Keep cool in the shade, enjoy the sunlight on a lounger, or drift across the pool with a cold cocktail in hand. 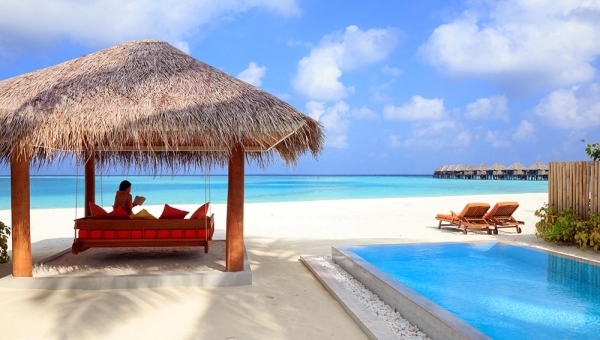 When you stay in this luxury hotel in the Maldives, theyâ€™ll bring drinks and snacks to your sun lounger from morning till night. 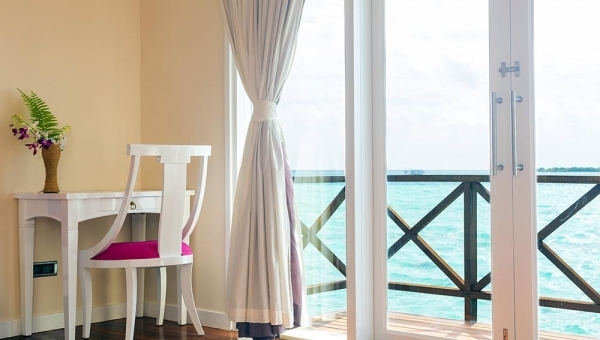 Nautilus enjoys stunning views of the Indian Ocean. Itâ€™s the perfect location for a refreshing dip between decadent cocktails. The menu features fresh interpretations of classic cocktails and signature mocktails. With an emphasis on fine artisanal spirits and fresh local ingredients, each drink is handcrafted and presented with elegant and playful touches. The tropical cocktails of Nautilus are perfectly complemented by the food menu of indulgent bites. The Well Done serves up fresh fish and seafood right on the beach. Grab a seat with a view and enjoy a succulent grill that has been prepared to perfection with local herbs and spices. Thanks to the stunning location they resort is able to source the fish just off the coast - as fresh as it gets! They also source herbs, spices, and vegetables from a dedicated local agricultural land so you know you're going to get the best. They also have a large selection of fine wines in the wine cellar ready to pair with your freshly prepared meal. The Aqua lets you enjoy breakfast, lunch, and dinner with stunning views. A lavish breakfast spread includes warm treats from the bakery, sweet, fresh juices made from local fruits, favourite Western dishes and local Maldivian fare. Come for lunch and dinner, too â€“ this lively restaurant is where you can come to refuel morning, noon, and night. Sun Aqua Spa at Vilu Reef specialises in healing and rejuvenating rituals with pure, wholesome ingredients that draw on the Earthâ€™s organic goodness. The indulgent treatment menu includes flower baths, Ayurvedic rituals, aromatherapy massages, and scrubs that will have you glowing. Treatments are based upon the elements of earth, water, air, and fire with an inspired mix of Eastern and Western therapies and modern beauty treatments. 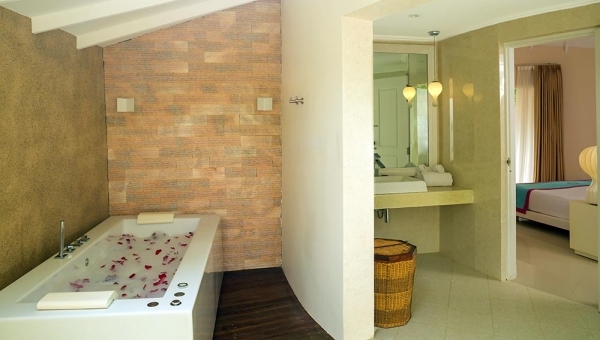 Feel the goodness of organic products and the therapeutic properties of the serene treatment spaces. 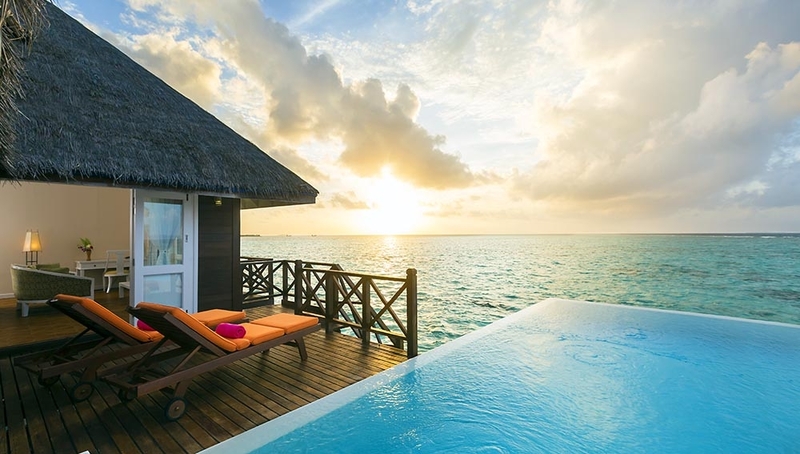 Stay relaxed as you indulge in the ultimate luxury at Sun Aqua Vilu Reef. 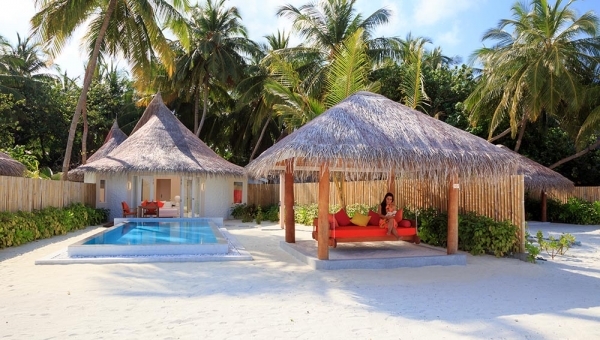 Our 5 star beach resort will bring you so much closer to the unparalleled beauty of the Maldives.